I had a great afternoon being shown around Perth by Sue Waters and colleague Frances. 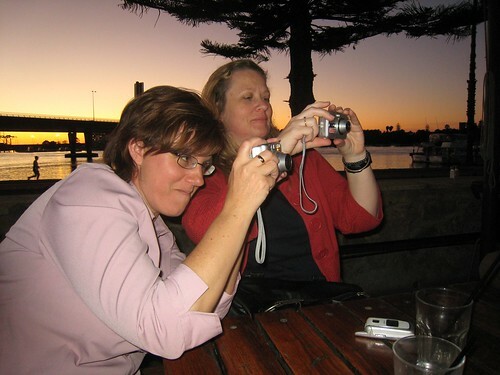 They were… rather prolific with camera and using PDAs to twitter as we tooled around town. They took me to see the city views from Kings Park, where we also managed to see real vegefitti, flowers, and the bizarre Boab tree. We had lunch. Sue twittered. I for to dip my toes in the Indian Ocean. Sue twittered. I hung my arm out the window and they said I broke the law. We stopped quickly at the Challenger TAFE where Sue teaches her Aquaculture classes. Yep, we saw fish!. 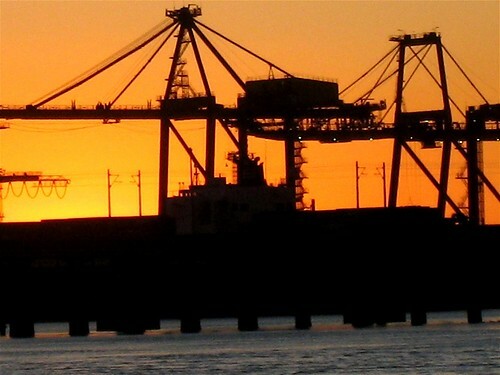 It is a very cool location right in the active shipping area of Freemantle. And then… then…. 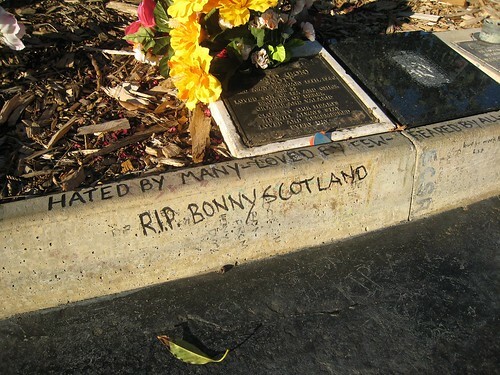 we went looking for the grave of AC/DC former lead singer Bon Scott. 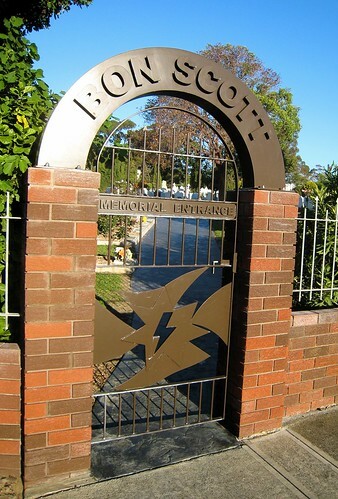 We found the location of the cemetery in Freemantle, but the place was huge! How did we find it? Sue twittered (yay!) and we found it! So I have achieved a closing of a teen-age loop being how crucial “Highway to Hell” was during my teen years in Baltimore, and my memories (fuzzy though) of seeing them in concert. Then we headed over the the “Left Bank” on the river for some drinks and food. thanks Sue, Frances, and later Marcus and ….. (oh shoot my mine just blanked on her name..) This was a great way to crown this time in Perth. At this point, I find my self the farthest distance from home, and am now on the return path with tomorrow’s flight to Darwin. Yes it was a great afternoon — although contrary to popular belief Kings Park and Cottlesloe beach I was responding in SMSs because my work colleague was asking me what was happening for dinner. 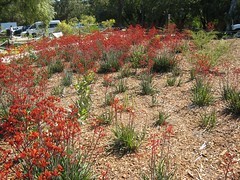 I had a quick check of twitter at Kings Park and then decided I did not have to know what everyone was doing. That is was okay to just enjoy the views without telling people about it. So the first time I used twitter was to locate the grave because Google had let us down. Next time I used it was at the pub to tell everyone that I was drunk from one glass of alcohol. A little internet tip- Sue. You don’t have to vigorously defend, explain every little bit said, commented about you on the web. Let some of them just go. It can come off as a tad overbearing to be corrected on every little thing. Give the world some more mystery about you, let them wonder. That’s my 5 australian cents (since I cannot find currency here to leave 2 cents). I was taking liberty to create some fun with a story. I am in fact jealous since my cheap phone cannot seem to verify itselft with twitter, so I was twitterless. Thanks for a fabulous afternoon and sightseeing- its what the doctor ordered. Glad you enjoyed visiting my home grounds. I would have liked to take you on a wild alcohol fueled booze bus trip through the winery’s down south however one day we may just take that journey with AccaDacca blaring in the background, in our beaten up Chevy tearing around on somebodies property way of the beaten track. Till then ……oh…….see you as part of th NT Showcase program when your up there with Bill Wade. He’s a great contact and send my regards. Hail hail rock n’ roll ! I’m up for *that* tour Alex- maybe we need a BoozeScope project. We had beautiful weather and great company what more could I ask for? True – good point. Actually more a reflection of my own concern that I am slightly obsessed with Twitter so was actually proud that I had been able to not be interested in using it all afternoon. Hope you enjoy your time in NT and feel better soon. I trust that you are safely back home and enjoying standing still for a while – no more taxis, airports, hotels. And I do hope that you are better now. Thank you for your presentations – I listened to you three times (once in Melbourne and twice in Perth) and found the content engaging & thought provoking. I too am leery of virtual worlds but am being converted, especially after Brad Beach’s excellent presentation about the work he is doing in SL at GippsTAFE. Left Bank in Fremantle is one of my favourite cafes and it was an exquisite evening. Being at Bon’s grave makes one feel like they are standing in the midst of greatness, or at least it should.